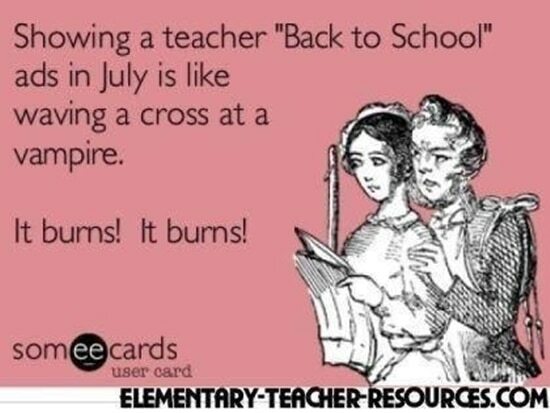 For teachers, summer is a mixed blessing. On the one hand, you are happy to be done with the school year and glad to finally have a chance to recharge. However, on the other hand, summer can be anti-climactic. When you spend ten months of the year mono-focused on your job and invest sixty-plus hours a week into your work, the sudden abundance of time can be just as unnerving as being crazy busy. Almost ever summer for the past eight years, I have moped around my house, bored to tears and directionless. Last summer, I didn't suffer with this summer malaise because, well, I was learning to walk again; it's nary impossible to get existential when you're trying to get that bipedal locomotion thing down, y'know. This summer, save for a few hormonal bouts, I've managed to avoid most of the Summertime Sadness because, like last summer, I've kept busy. This year, I have spent the past four weeks working part-time hours at the local community college where I am employed as an adjunct librarian. I really love working in the library and I have found that working with a college population is not all that different from working with a high school population. It's been a lot of fun. These shifts have given structure to my day and have given me great professional satisfaction as well as some extra pocket money. Thursday will be my last day in the library until mid-August when the library opens up again for the fall semester and I have been doing a lot of thinking about what I am going to be doing during the remaining five weeks of my summer vacation. One of the primary things I will be doing will be to buckle down and complete some large chunks of a writing/research project I am working on. I want to get a majority of this project in the can before the end of August. Another project I need to work on is to complete some initial planning for the start of the next school year and finish a close re-read of the texts I assigned as summer reading to my students. During my time off, I also need to give my room a thorough clean and do some redecorating; as sad as it sounds in the six months I have lived in my new place, I haven't done a stitch of decorating. Lastly, I do plan on doing some minor traveling to places in state I haven't seen and, should our dates align, I hope to visit my dad, too. So, we'll see where I end up going what I am able to get up to. What do you do to keep the Summertime Sadness at bay? What have you done this summer?